"The year is 2032, sixteen years after a deadly virus—and the vaccine intended to protect against it—wiped out most of the earth’s population. The night before eighteen-year-old Eve’s graduation from her all-girls school she discovers what really happens to new graduates, and the horrifying fate that awaits her. 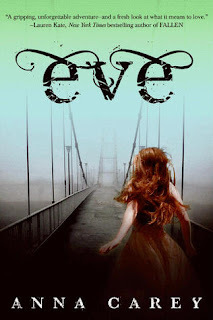 I would have to put Eve by Anna Carey in my..I enjoyed it but not overly wowed...category. I really like the overall concept of the story. Having a plague ravage the world leaving few survivors that have to rebuild society. It's not something we haven't ever heard before but everyone puts their own twist on it. It was an easy lighter read for me, which is not a bad thing. I could tell that this was the first book in a series because there were many questions left unanswered. I couldn't say the ending left me hanging from a cliff and salvating for the next installment but I did enjoy it. I noticed some familar themes....Eve herself has a little Wendy from "Peter Pan" going for her, with the exception of having to fight of sexual advances. This of course is no Neverland though with the wild strays having a bit of "Lord of the Flies" going for them. The romance was cute not epic but I did believe the chemistry of the characters. I will probably read the second book because I feel an authors writing grows just as much as their characters do. So I'm curious as to how some of the issues will be worked out and how some questions will be answered. I wouldn't run up to you on the street and say you have got to read this book.